Photo by Coolcaesar on Wikipedia. Used under a Creative Commons license. The D.C. Circulator National Mall route will be open for service on Sunday, according to the D.C. National Park Service. The first stop is at Union Station and the final stop is near the U.S. Capitol and the National Museum of the American Indian. The circulator makes 15 stops running through the National Mall and the national memorials. The route begins with the National Gallery of Art and its Sculpture Garden, National Museum of Natural History, the Washington Monument, the Holocaust Memorial Museum, the Thomas Jefferson Memorial and the Martin Luther King Jr. Memorial. At the Lincoln Memorial, the bus heads back towards the mall and runs through the Vietnam Veterans Memorial, the World War II Memorial, the Smithsonian Visitor Center, the National Air & Space Museum and the Hirshhorn Museum and Sculpture Garden. For the full route map and bus stop location details, you can view this PDF. 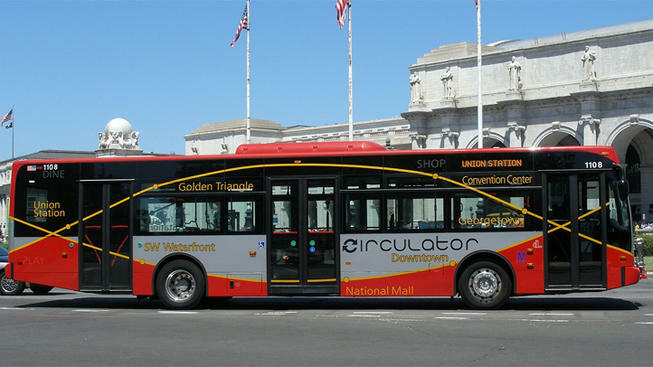 All Circulator buses cost $1 and accept SmarTrip cards. It is recommended you use a SmarTrip card, as your fare will last for two hours. If you use cash you will need to pay $1 each time. From April 1 to Sept. 30, the bus will run from 7 a.m. to 8 p.m. on weekdays and 9 a.m. to 8 p.m. on weekends. From Oct. 1 to March 31, the bus will run from 7 a.m. to 7 p.m. on weekdays and from 9 a.m. to 7 p.m. on weekends. There will be a ribbon-cutting ceremony Friday with Mayor Muriel Bowser, Delegate Eleanor Holmes Norton, National Park Service National Capital Regional Director Bob Vogel and others at the south side of the Lincoln Memorial about 11 a.m.